Dapper Gentlemen, the app development group behind the riotously triumphant Ugly Meter and Meatball Madness, today launched its latest application for iPhone, iPod touch and iPad users. Wordicus brings mobile game lovers a fast-paced, word-puzzle action game and featuring both turn-based multi-player and single-player modes. Wordicus 1.25 is a acknowledgment to typical word-themed games that transforms multi-player gaming. Besides, the Wordicus 1.1 version features a unique engine that allows people who speak two different languages to play against each other in their individual native languag, making for a truly world-wide opponent base and extreme fun. * Players use a touch-screen interface to draw a line across a grid of letter tiles to form words then watch the word disappear as new blocks drop into their place. * A player's score is based on the value of the letter tiles used and the special power tiles. 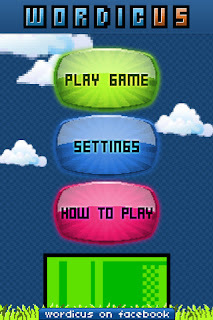 * Players unlock achievements and level up to access special blocks that multiply their score, destroy surrounding blocks and more. * Players work through the more than 40 levels by completing words and earning points. * Players can simultaneously play up to 20 games against opponents with an at-your-leisure, turn-based multi-player option or let the game find random opponents from across the globe. * While waiting for opponents to make their move, players can choose one of two innovative single-player modes: Zen Mode, which allows players to take their time and spell as many words as they can; or Blitz Mode, which sets a time limit for players to try and spell as many words as they can before the timer runs out.